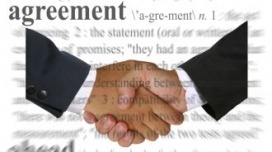 A contract of employment usually defined to mean the same as a “contract of service”. A contract of service has historically been distinguished from a “contract for services”, the expression altered to imply the dividing line between a person who is “employed” and someone who is “self employed”. The purpose of the dividing line is to attribute rights to some kinds of people who work for others. This could be the right to a minimum wage, holiday pay, sick leave, fair dismissal, a written statement of the contract, the right to organize in a union, and so on. The assumption is that genuinely self employed people should be able to look after their own affairs, and therefore work they do for others should not carry with it an obligation to look after these rights. In Roman law the equivalent dichotomy was that between locatio conductio operarum and locatio conductio operis (lit. a hiring contract of services and by services). The terminology is complicated by the use of many other sorts of contracts involving one person doing work for another. Instead of being considered an “employee”, the individual could be considered a “worker” (which could mean less employment legislation protection) or as having an “employment relationship” (which could mean protection somewhere in between) or a “professional” or a “dependent entrepreneur”, and so on. Different countries will take more or less sophisticated, or complicated approaches to the question. Know when you should — and should not — ask a new employee to sign a written employment contract. A written employment contract is a document that you and your employee sign setting forth the terms of your relationship. You don’t have to enter into a written contract with every employee you hire. In fact, written employment contracts are generally the exception, rather than the rule. In some situations, however, it makes good sense to ask an employee to sign a contract. What About Written At-Will Agreements? When we refer to written employment contracts, we mean a contract that limits the employer’s right to fire the employee, usually by detailing the grounds for termination or setting a term of employment (for example, one or two years). Some employers require employees to sign a written agreement stating that they are employed at will — that is, that they can quit at any time, and can be fired at any time, for any reason that is not illegal. Employers might ask employees to sign an offer letter, handbook acknowledgment, or other document agreeing to at-will employment, for example. These documents do not limit the employer’s right to fire the employee. Instead, they affirm the employer’s general right to fire at will. Finally, using an employment contract can give you greater control over the employee. For example, if the contract specifies standards for the employee’s performance and grounds for termination, you may have an easier time terminating an employee who doesn’t live up to your standards. For example, if you decide you want to end a two-year contract after six months because you don’t really need the employee after all, you can’t simply terminate the employee — this would be a breach of contract. Similarly, if the contract promises the employee health benefits, you can’t later stop paying for these health benefits as a way to save money. The only way to change the terms of the contract is to renegotiate them. This can be done, but it’s time-consuming and requires the employee’s consent. Another disadvantage of using employment contracts is that they bring with them a special obligation to deal fairly with the employee. In legal terms, this is called the “covenant of good faith and fair dealing.” If you end up treating the employee in a way that a judge or jury finds unfair, you may be legally responsible not only for violating the contract, but also for breaching your duty to act in good faith.